LIKE HEALTH, WATER IS OFTEN TAKEN FOR GRANTED. Utilities, in general, produce some of the cleanest drinking water on the planet. Maintaining water quality is challenging once the water enters a facility's internal system. Per liter, approximately 100 million bacteria are floating around in the water lines of most buildings. Why? Most facilities' drinking water travels through pipes that vary in age and composition. Here, naturally occurring chemicals and minerals - some dangerous - can reach drinking water. Plus, low flow can cause stagnation, causing bacteria to grow and even causing lead to leach into the water. Filtration science in an Oasis© water distribution system is as critical to safe consumption as the provision of water is to life itself. Provision is nothing without purity. 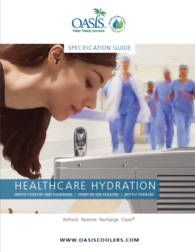 In the hustle and bustle of a healthcare facility, we are the hydration Oasis. We are the wardens of contaminants, locking away - or eradicating - what should never get through. And we promote the sustainable use of water, and cool and purify with minimum burden on the power grid.